CRM | CRM CONSULTANT PC METHODS INC.
What specifically does a CRM system do that will benefit your business? It manages and organizes all communications with customers, vendors, and employees, in a centrally located, security safeguarded place. So a salesman, customer service representative, collections person, and product safety person can look at the same collection of messages, letters, invoices, emails from a customer that they have access to. This empowers the business as an organization to maintain a consistent, continuous relationship with its partners regardless of which employee is making the contact on any given day. CRM is more than a product, it’s a philosophy. 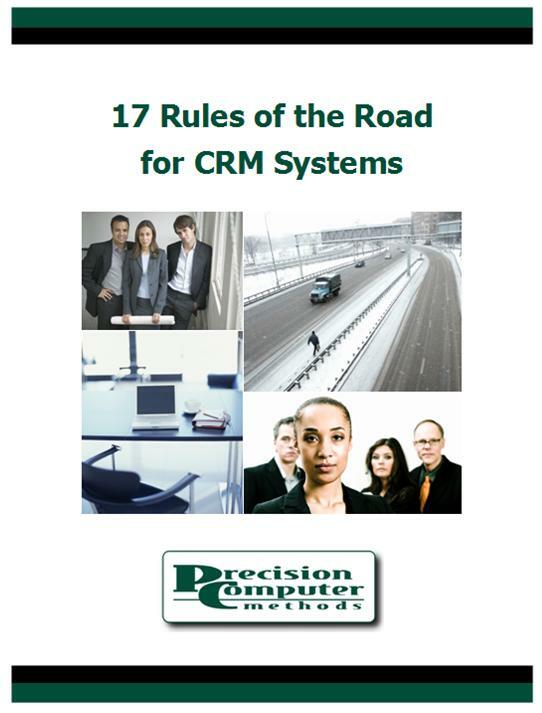 When your company chooses to implement a CRM system, it is taking a dramatic step forward in customer commitment. And, since customers drive your business, you’re leaping ahead in your ability to generate and manage revenue too. The benefits will not only come from the product you purchase, but also from the implementation plan you follow. The more thoroughly your company embraces a CRM philosophy, the more it will benefit from the features your CRM software offers. CRM philosophy is simple: put the customer first. This is a modern development of the old ‘the customer is always right’ adage on which so many successful businesses have been built. When your business looks at every transaction through the eyes of the customer, you can’t help but deliver a better experience to your customers - which in turn increases loyalty to your company. And, through customer-focused business practices, you often find new ways to streamline old methods and jettison administrative overhead that no longer benefits you or your customers. With the help of robust customer relationship management solutions like SageCRM, PC Methods is quickly able to implement a business automation solution to help you improve productivity and reduce costs. To understand how someone goes from prospect to client and better control costs, companies need a full view of their customers and processes. Whether you are looking for Marketing, Sales Force Management or Customer Service automation, PC Methods can provide an effective business solution to help eliminate missed opportunities and build better customer relationships.